For the first time in Wisconsin women’s basketball history, the Badgers will be coached by a man. Jonathan Tsipis was introduced as the new women’s coach at Wisconsin during a news conference at the Nicholas-Johnson Pavilion on Thursday. Wisconsin athletic director Barry Alvarez said the issue of gender was not a consideration in making the selection. Tsipis said he plans to have strong female role models on his coaching staff, which he said he hopes to have in place before the next open recruiting period in mid-April. Tsipis met with the returning players, spoke via telephone with each of the six members of the 2016 recruiting class and made home visits to the top two players in the state for the 2017 class, Madison Edgewood’s Estella Moschkau and Kenosha St. Joseph’s Sidney Cooks. Tsipis takes over a program that went 47-100 in five seasons under Bobbie Kelsey. Kelsey was fired after the Badgers finished 7-22 overall and in 13th place in the Big Ten Conference last season. 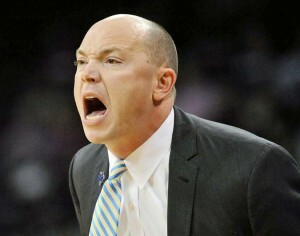 Tsipis left his position as associate head coach at Notre Dame to become the new head coach at George Washington. In four seasons, his teams had a 92-38 record, including a 55-11 mark the last two seasons. The Colonials won Atlantic 10 titles in each of the last two seasons, playing in the NCAA Tournament both years. Wisconsin has struggled recently to keep the top players at home. Green Bay, Marquette and Milwaukee have all made considerable progress in landing some of the state’s top recruits and they’re not going to back down. But there’s no reason why Wisconsin shouldn’t be landing a big chunk of the state’s top players and it’ll be up to Tsipis to make that happen.